On the Sunday before Memorial Day, I decided to get a little bit of an inside view of how veterans see it. So I rode my motorcycle over to a dealer in Gaithersburg, Maryland at 7 a.m. There I joined what looked like two or three thousand other riders to drive in twin columns to downtown D.C. via the George Washington Memorial Parkway. I peeled off at the Roosevelt Bridge rather than join the galaxy of bikes arriving at the Pentagon North parking lot from all over. The lot provides the staging are for the official Rolling Thunder parade. To do that you’ve got to park your bike and wait until noon. Whereupon the parking lot empties and the bikes form the parade for the next several hours. Instead I parked in the field at the southwest corner of 23rd Street NW and Constitution Avenue. Along with what looked like another 5,000 or so bikes. From there I was only a block from the Vietnam Memorial. Riding to the Wall or participating in Rolling Thunder itself is supposed to be a way of honoring those lost in the nation’s wars. Rolling Thunder emphasizes not forgetting those missing in action. Therefore I was eager to visit The Wall, having not visited it in many years. 2018, after all, is 50 years since many pivotal events in and connected to the Vietnam Conflict (as the U.S. Park Service officially calls it). The Wall remains an amazingly powerful, evocative construction, decades after the controversy over its design. 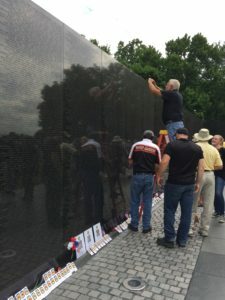 Vietnam is recent enough that The Wall draws people with direct memory of those 58,318 names engraved in its black granite panels. It turns out The Wall is one of the most-visited memorials. I remember when a 21-year-old Yale student was chosen as the winner of the design contest for the Vietnam Memorial. It was widely panned as black gash, a burial site, an insult. In reality it’s a place of peace and reflection. It’s power comes from the names. A name is a sacred thing, and so in preserving each name The Wall in a sense preserves all the named people. Photographing a name from a soldier lost at the height of the Vietnam Conflict. Many visitors have direct memory of individuals named. Watch the people looking at the wall and you’ll see the tears running from beneath sunglasses. For the most part, veterans blend into the general population. 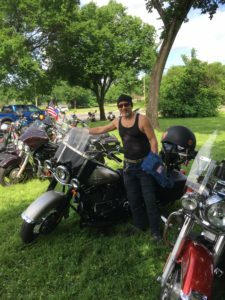 I found that the pre-Memorial Day Rolling Thunder offers a chance for many veterans who love motorcycling to express both their vet status and riding affinity at once. Maybe someone ought to stage a Veterans Day ride of some sort. 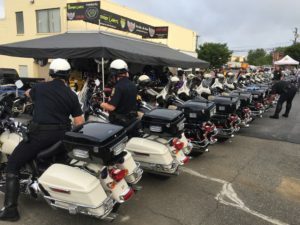 On Rolling Thunder day, veterans seem more than happy to have the rest of us join in and connect, if only for a few hours of riding and conversation. Bikers love to talk about bikes and riding. That often leads to deeper conversations about work and past lives. Biker-veterans express their status in several ways, principally through patches on their riding vests. Many of these patches simply say “Veteran” or “Vietnam Veteran.” Others are more descriptive. Patches — sold by camp-following vendors in huge tents — come in a nearly infinite variety specific to branches, ranks, battalions, ships, units, platforms and squadrons in which or on which their wearers served. The ride into D.C., no less than the Rolling Thunder Parade itself, brings out people along the roads and on the overpasses, shouting and waving flags. I thought, why wave at me? I’m just a radio host on my Harley riding to pay respects to those guys (it’s 99 percent men) with the patches. Nevertheless I got into the moment, honking my horn and waving back. Quite a sight, too, from saddle of my “hog,” with motorcycles stretching out in from and behind as far as I could see. I rode next to a guy, also on a Harley, who seemed to have the world’s loudest after-market mufflers. He revved his motor at every waving knot of people, making me wish I’d had an earplug in my left ear. Everyone rides with joy but also with care. It’s a lot of motorcycles in close proximity. Two bikes side by side in front of me carried couples, filming one another with their phones. A special thanks is due to another uniformed branch of service, namely local law enforcement. Motorcycle and regular units blocked the intersections and on-ramps as miles-long streaks of bikes streamed into D.C. I spent a little time wandering in “Thunder Alley,” a sort of flea market of biker stuff across Constitution Ave from the National Mall. From one of the vendors I did buy a commemorative patch for my own heretofore unadorned denim vest. I also bought an American flag patch. A helpful woman at an industrial-grade machine sewed them on in exactly the right spots. She put the flag on the left chest, high on the vest. “That’s over your heart. Nothing goes higher than the flag,” she instructed. The commemorative patch is on the back at the bottom left, a starting point for building up my own wall of patches, I hope, from future rides. But least now, on every ride, I can carry bit of Memorial Day. This post is adapted from a column that first appeared at federalnewsradio.com.